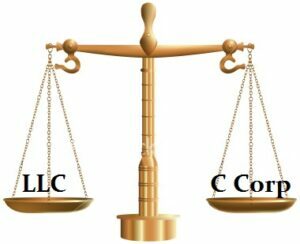 When startups are choosing a form of entity – usually either an LLC or a C-corporation in my experience – the common advice is to be an LLC (which by default is taxed as a partnership), unless the company expects to receive venture capital funding, in which case it should be a C-corporation. The conversion to C-corporation status can happen later – even concurrently with the venture capital funding – without tax impact. However, this short article in Inc. magazine by Ryan Feit argues that even startups expecting venture capital funding should resist this advice and remain an LLC. Feit notes that the double taxation of C-corporations (corporate-level tax plus income tax at the shareholder level) has a huge impact, which is why single-taxed LLC are the go-to default, and that the rationale for nevertheless using C-corporations – that the VC funds need it for their internal purposes – is misguided. VCs do need to make their investments directly into C-corporations, because as Feit notes, LLCs can generate unrelated business taxable income, which is a problem for the funds’ tax-exempt limited partners. However, the simple fix for this, says Feit, is to create a blocker corporation, set up as a C-corporation, that takes the investment funds from the VC fund, and then that blocker, in turn, becomes a member of the LLC, which remains intact in that form. Then the non-VC investors in the LLC aren’t stuck with the double taxation. I’m not qualified to simply endorse Feit’s advice, since I’m not a tax attorney, but with the caveat that I always present to clients that they need the input of a qualified tax advisor when making entity choice decisions, it makes sense to me to remain as an LLC, using the blocker corporation solution if and when the company gets VC financing. From a non-tax perspective, I’m very much in favor of LLCs over corporations – the documentation is much simpler, and there are fewer formal requirements to observe. Accordingly, companies should remain as LLCs if there no compelling tax reason not to do so.